This inaugural edition of The Kool-Aid will address the controversy of comparing LeBron James, Kobe Bryant, and Michael Jordan. Future editions of The Kool-Aid will attempt to discuss other hotly debated issues in sports with one man's take. Questions or comments should be sent via e-mail to koolaidQandA@gmail.com . This topic has received more punishment than the poor fax-machine/printer from Office Space, but I have to get my swings in. And yes, someone might need to get Ron Livingston and Ajay Naidu to hold me back from beating the hell out of the poor thing. I'm going to break down the three comparisons, and tell you who wins. (Are you scared yet?) I'm going to disregard the fact that they played in different eras—possibly the only notable difference being the physicality of the game in Jordan's era as opposed to the "no hand-check, honey-I-think-I-have-a-yeast-infection" games these days. This is the comparison that makes the most sense. Is anyone else sensing the eerie parallels of Kobe's career in reference to MJ? Who am I kidding—of course you are. The three consecutive titles with Phil Jackson, the brief championship contention sabbatical, the return to glory, and Kobe's second possible threepeat (Pat Riley, I don't get paid for this). Both are pathologically competitive. One was something of a media darling and marketing monster, the other possibly the world's most famous adulterer-athlete before Tiger Woods. Jordan had 15 seasons under his belt (including the Washington seasons) and ended with an impossibly impressive resume. I won't bring up too many numbers, but there was a season he averaged 32/8/8/2.8. He was the most complete statistical player of his generation, and had enough rings for both of his hands. There is no such thing as perfection in basketball, but Jordan was the closest individual to it. Kobe is entering his 14th season, with four rings. To his credit, technically his career didn't really start until his third season, where he started all 50 games of the lockout shortened season. In terms of age, Kobe turned 21 (the age at which Jordan began his NBA career) the season they won their first of three championships in 1999-2000. Kobe and MJ are so similar in their career paths and mentality towards the game, even if their games are remarkably different. As for now and comparing careers (Kobe's career might have some serious legs on it if he's playing this well at 14 seasons), MJ retains the edge. This is by far the most intriguing matchup. Has anyone noticed that LeBron and MJ's games are unnervingly similar? Both of them don't enjoy taking threes (although LeBron is starting to develop a three-point stroke out of necessity), both of them like to make a show of how inferior your athletic gifts are in comparison to themselves, and both of them are statistically all-around players. LeBron is posting Jordan-esque PER seasons. They are, from a sheer hardwood-only standpoint, very close to each other—aggressors to the basket, always willing to make the best play. Jordan was infinitely more clutch, but LeBron's career (especially his Playoff career) is still very young. Also, Jordan never had LeBron's combination of size and athleticism. He made up for it in heart. LeBron is effectively a Karl Malone with ball-handling skills, an ability to create, and make, his own shot, and an ability to run the floor. In other words, closer to a shorter version of Lamar Odom, only with testicles that weigh ten pounds each and a vertical that gives most players in his position wet dreams. LeBron has too much of his career unwritten to be mentioned in the same sentence as his Airness (unless the sentence is "LeBron James believes no one should wear Michael Jordan's number"). The comparison here is obvious. Jordan is still infinitely more marketable than LeBron because he's actually won a championship to back up all that trash talking and "Basketball Icon" status. LeBron? I don't see a ring in his future this season, but I certainly see at least a couple coming his way in the near future—maybe then he can properly be the face of the league. Ah yes, the meat and potatoes. The main gripe about LeBron, be it online in the blogosphere, ESPN, or Nike commercials, is that he lacks Kobe's rings. However, let's be fair about this. How many seasons has LeBron had All-Star Caliber teammates? That's right, even if you count "Wanda Sykes Dressed in Drag" dropping 17 PPG All-Star caliber, that's only one season—by the way, the Cavs went 66-16 that season. I think it's only fair that we compare LeBron and Kobe's playoff performance in a situation where Kobe doesn't have Shaq to dominate the first three quarters, or Pau Gasol to kick the ball out in traffic for a gimme basket. In their comparative "off" seasons, whereas Kobe had an ideal "point-forward" (Lamar Odom) to fit into Phil Jackson and Tex Winter's triangle offense, the offense oftentimes ran through Kobe. LeBron's second fiddle was Larry Hughes (Larry who? You mean Larry who's played more than 70 games twice in an 11-season career?). Nothing down on Larry Hughes, but I don't think I need to say much more—Hughes underperformed and was subsequently traded after missing 58 games in less than three seasons with the Cavs. In the same stretch, let's take a look at LeBron's team's playoff performance. I think it can be argued here that LeBron did significantly more with less. If LeBron had an All-Star teammate in his prime so that he wouldn't have to isolate his way to 30 points every night, I think we would see a much more interesting Cavaliers team. 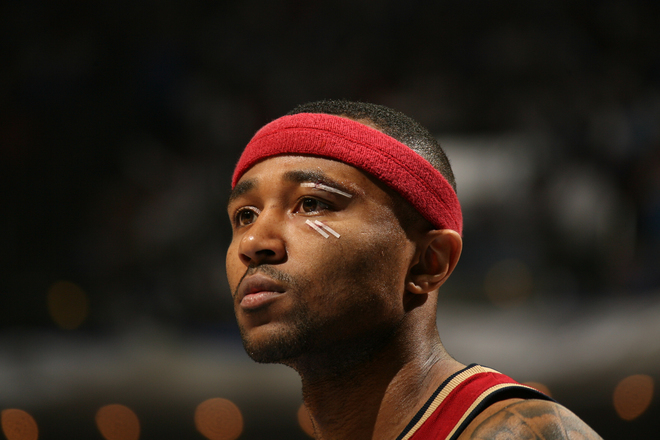 Mo Williams is not consistent enough to merit being a support that would draw a double-team. There needs to be at least two players on a team that can carry the load. In the same way KG, Jesus, The Truth, and the Celtics make other teams nervous about who will get hot at what moment (or whether or not they need to close up the lane before that shifty, talented point guard decides to rip them to shreds), if LeBron wants to advance in the playoffs, he needs to have a second option that can command a double team. In potential title years, I see LeBron averaging closer to 23-25 points a night with bigger assist numbers and an astronomical FG percentage. Kobe has nights where he isolates his way to 30 points in spite of his teammates. I see moments where Kobe's "taking over the game" is still unnecessary, but overlooked due to the Ws. The Lakers this season are not performing optimally due in part to Kobe's lack of trust in the post game. When he should be pounding the ball into the bigs, I see him taking turn around jump shots and contested threes (he makes some of them, but misses a lot of them, too). Kobe's individual ceiling is not visible to the naked eye—he is a prolific scoring two-guard unlike anything the league has seen before (not even Jordan's jumpers in his prime went in as easily as they did for Kobe in his 81-point game). His offensive game is an amalgamation of Earl Monroe, Hakeem Olajuwon, and a jumper entirely his own. Yes, I believe in future years, Kobe's jumpshot will be his trademark; not for the form, which is not orthodox in its beauty like a Reggie Miller or Ray Allen, but for its sheer ability to control the ball trajectory regardless of defensive circumstances. If Reggie and Ray's jumpers are your standard supermodel, Kobe's jumper is like an unusually beautiful contortionist at Cirque du Soleil. As for LeBron, his individual ceiling is not something that we're overly concerned with. I mean that in a half "we don't even care because it's beyond that which can be conceived" and a half "we won't even have to worry about it, because that's not what LeBron is worried about." LeBron's mentality to the game is that of someone who wants to win games. Kobe's mentality to the game, at least in his formative NBA years, was a nasty part of why he still has 10-for-30 nights against the Clippers and 11-for-33 days against the Cavaliers. "...I improve every day as a player, and I want to SHOW that I've improved." It showed me where Kobe's focus was. For those of you keeping score, Kobe's focus in 2001 was on Kobe. LeBron's intentions are clear—he wants to win rings and make tons of money. I think we can gather that much from him, and in doing so, narrow down where he will sign next season to big markets with off-the-court opportunities, and of those, teams with championship contention potential. Unfortunately for Kobe, the better player in this case is measured by their ability to make teammates better and make the best decision to help win games. In a generation that needs a superstar, Kobe's individual achievements may eventually be overshadowed by either his selfish past or his ability to win rings, the latter being more likely. LeBron James, regardless of his dunk-tape jacking, handshake refusing, mother-disrespecting antics, will be seen in the future as the model superstar and the next marketing boon for the NBA. His amazing athletic prowess makes him fun to watch, but his cerebral competitiveness, the kind that knows when to lay in the weeds and when to take over games, is the prototype of a leader who wins rings with decently-staffed teams. The summer of 2010 will mark the beginning of a dynasty for whichever team LeBron chooses to sign with, not only because LeBron will pick a winner, but because LeBron is willing to take a step back on the hardwood to make it work. LeBron's legacy is up in the air as of now, but there is very little doubt that LeBron will be able to be looked back on as one of the greatest to ever play the game.